Development of a country is mainly tracked towards its levels of economic production measured in GNI per capita or similar indicators. 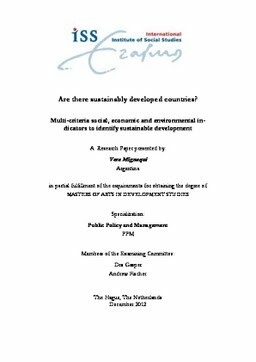 In this paper, “development” is considered as a desired state where sustainable development is met. Then a “developed” country is proposed to be a “sustainably developed” country, which is one that has a broad fulfillment of basic needs and accessibility to economic means among its population and that it does so within ecological limits, implying three dimensions: economic, social and environmental. A multicriteria ranking (called SDR) was developed to identify these countries. The SDR results showed a global poor performance in terms of sus-tainable development. Moreover, they showed that there are no “sustainably developed” countries. Although the dominant developmental view is aligned with higher levels of economic performance, globally the economic is not the best performing dimension according to the SDR. Even more, the GNI per capita is the second worst performing indicator. There were also found countries with good performances in the social and environmental dimensions, and even in income distribution levels (i.e. Gini Index), although having lower GNI per capita than the minimum expected for a certain level of development. Moreover, it was found that very high levels of GNI per capita imply a bad performance in the environmental dimension. Both results support the setting of desired levels of GNI per capita to lower levels. Finally, the SDR provides a useful tool to assess the global and individual performance in the three dimensions of sustainable development.